Are you looking for small trailers for sale? We at Trik Trailers offer high quality trailers which are also affordable. 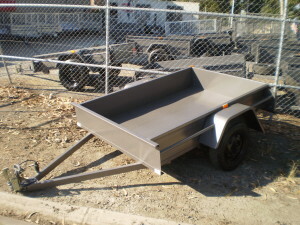 We are the leading suppliers of small trailers in Melbourne, Victoria, and Dandenong areas. We take great pride in calling ourselves the small trailer specialists! We offer a wide range of small trailers with different specifications to suit your choice and budget. Our trailers are designed to suit a wide range of purposes from family getaways to domestic chores and even carrying heavy loads like brick and sand etc. You can be assured of the highest standards of quality and safety in our small trailers. Our most popular model with a chequerplate floor & strong chassis. The ideal trailer to have in the backyard for tip runs, garden rubbish, furniture & domestic chores. Rated at a whopping load of 2000 kg Gross makes the tandem trailer the ideal trailer for carrying heavy loads, dirts, sand, bricks and rocks. All fitted with brakes standard.